Adoniram Judson Gordon was born in New Hampton, New Hampshire, on April 13, 1836. His parents were Christians. His youth was characterized by hard work in his father’s woolen mill, long walks to school, and a devout church life. At about age fifteen Adoniram was converted to Christ. Soon after his conversion he was baptized and received into the church. A year later he felt the call of God to the ministry. He attended nearby New London Academy and then Brown University. In 1860 he entered the Newton Theological Seminary. Upon graduation in 1863 he accepted the call to be a Baptist pastor at Jamaica Plain, near Boston. For six years he pastored this church while he grew in his spiritual experience. In 1869 he accepted the call to the Clarendon Street Baptist Church in Boston. He remained there for more than a quarter of a century. 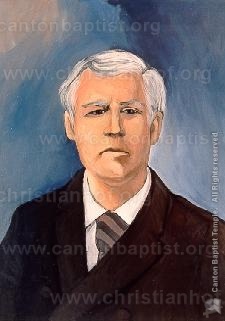 In 1878 he began editing the Watchword, a monthly magazine, and in 1888 he became chairman of the Executive Committee of the American Baptist Missionary Union (since 1910, the American Baptist Foreign Missionary Society). In 1889 he founded the Boston Missionary Training School (now Gordon College and Divinity School). Gordon saw the Clarendon Street Baptist Church completely transformed into one of the most spiritual and aggressive churches in America. He was also one of the most prominent leaders and speakers in Dwight Moody’s great Northfield Conventions, and one year Moody left the convention entirely in his charge. In his Ministry of the Spirit, which is perhaps his greatest work, Dr. Gordon presents the work of the Holy Spirit in a three-fold aspect: sealing, filling, and anointing. Among his better known hymns are: “My Jesus, I Love Thee” and “I Shall See the King in His Beauty.” On the morning of February 2, 1895, Dr. Gordon, with Victory as the last clearly audible word on his lips, fell asleep in Jesus.